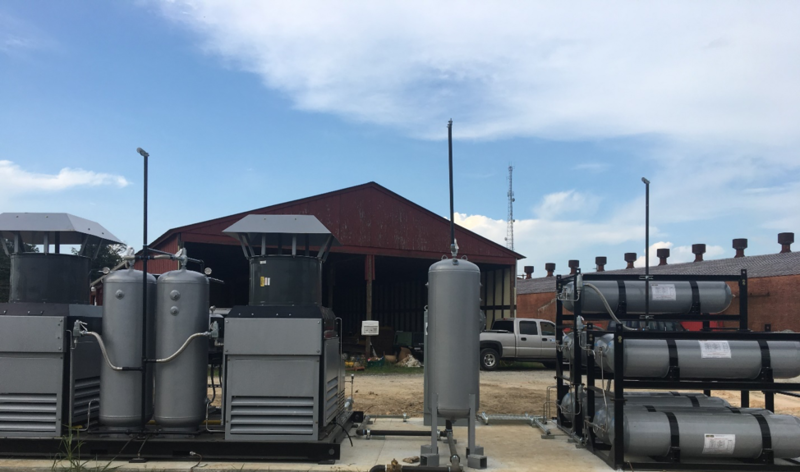 WireTough offers a full line of CNG ground storage products in different sizes and pressures. They range from 200, 600, 1,000, and 2,130- liter capacities, with pressures from 290 (4,200 psi) to 350 bar (5,100 psi). Depending on its size and operating pressures, each individual cylinder can store from 20 GGE to 181 GGE. WT tanks have been used to create CNG fueling stations, like the one pictured above, that are much less expensive than traditional sphere or large tube storage solutions. Our 200 liter ASME approved tanks can be used to create CNG fueling stations that are modular, very competitively priced and ASME approved. Each tank is 200 liter (17.7 GGE) at the Maximum Operating Pressure of 4,200 psi. The station shown in this picture uses ten of these tanks to provide 178 GGE of storage. Because of the modular nature of our product, systems can be tiered to create a cascade and can be scaled to provide only the amount of storage needed. At dimensions of 17.2 inches in diameter by 77 inches in length and a weight of only 530 lbs. per cylinder, site preparation, transportation and assembly are easier and less expensive. ASME Certified 1600 ltr. Ground Storage Cascade. 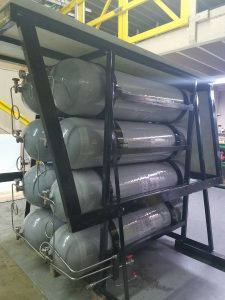 WireTough’s 200- liter ASME Section VIII- Division 3 compliant, ground storage cylinders can be tiered to create a cascade and can be scaled to provide only the amount of storage needed. At dimensions of 430 mm x 2 meters and a weight of only 530 lbs. per cylinder, site preparation, transportation and assembly are easier and less expensive. When compared to the cost of conventional spheres or large cylinder storage, the savings are quite considerable! WireTough also offers, 8.75 m long hydrogen storage cylinders, at capacities of up to 1700 L at a pressure of 450 Bar. These cylinders can be shipped individually or assembled as arrays.